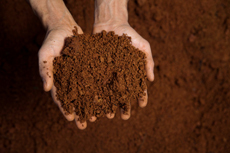 We provide a variety of specialized soil analyses. Pricing depends on the required analysis, sample type and quantity. In addition to Elemental Analysis, we perform specialized tests such as Acid-Base Potential, Cation Exchange Capacity, Sodium Adsorption Ratio, Particle Size, exchangeable Acidity, Extractable Anions and Cations, Saturation Capacity, Sulfate Adsorption Isotherms, etc. We maintain a USDA permit to allow for processing of soil samples from agriculturally quarantined areas. Please contact us for additional information.